It took me a while to realize the value of sharp tools. For a very long time I was not a big fan of hand planes. I was of the opinion that newer methods were available for these same tasks, so they must be better. It all stemmed from a bad experience with edged tools early in my woodworking career. I used an old hand plane, and it worked terribly. I was too new to understand that the iron just needed a good honing. I had all but checked out when I got the wild idea to make my own hand plane a few years later. 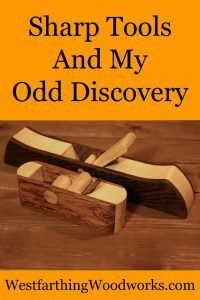 I saw the Krenov style hand planes that were being made by talented woodworkers online. Once I saw them, I knew I had to make one. In the course of researching the Krenov method, I also ran into article after article about how to put an incredibly sharp edge on the plane iron. The fact that I kept seeing it over and over again made me read a few of these articles, and then buy a nice combination water stone. Before I placed my iron in the plane, I had it honed to 4000 grit on the water stone, and I was able to shave hair from my arm with it. 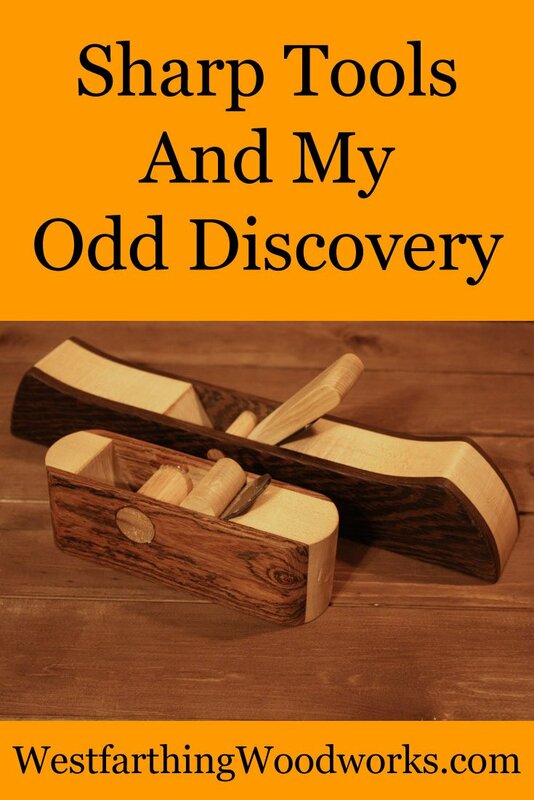 Once I made my hand plane, and used it for the first time, the experience was magical. I spent at least half an hour planing the edge of a board clamped in a vise. The slices were so thin you could read through them. I made a huge pile of plane shavings that day, and from that point on I was in love with sharp tools. This is my first ever hand plane. It would not win any beauty contests, for sure, but it works like a champ. I really love how you can adjust these wooden hand planes with a tap of a hammer on the front or back side. If the cut is a little too much, a small tap on the back side retracts the blade. Too thin, and a tap on the front fixes that too. I had a nice looking piece of Bocote that I used for the faces of the plane, with the center and wedge from Maple. The dowel is Poplar, and much larger than it needs to me. A small mistake in the angle of my drill press table lead to the hole being off center. I had to drill it a second time, and it needed to be large enough for the only dowel I still had available in the shop. I was so excited to use my new hand plane, that I did not want to have to rush to the store again for another dowel. 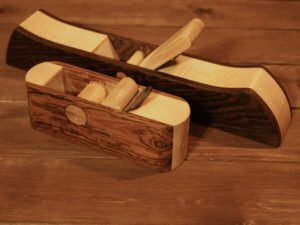 Since my first hand plane, I have made several more. They ranged in size from smaller units, to large jointer planes. Once I discovered that a sharp iron in a hand plane was like cutting wood with magic, I ended up using these tools all the time. If you have been wanting to use a hand plane, or had a bad experience with a hand plane or another edged tool, try sharpening it. Do a little looking around and find a nice book on sharpening. Once you put a razor sharp edge on your plane iron, the experience will be night and day. In fact, you will end up using that tool far more than you ever did before. I use my first hand plane all the time to remove the bulk from something that I have to sand flush, and it works faster than my orbital sander. It also doesn’t make scratches around what I am trying to sand. Then, I sand the rest of the way flush with a sanding block. This entire experience is all owed to Mr. Krenov, who designed a wooden hand plane that can be made by anyone. 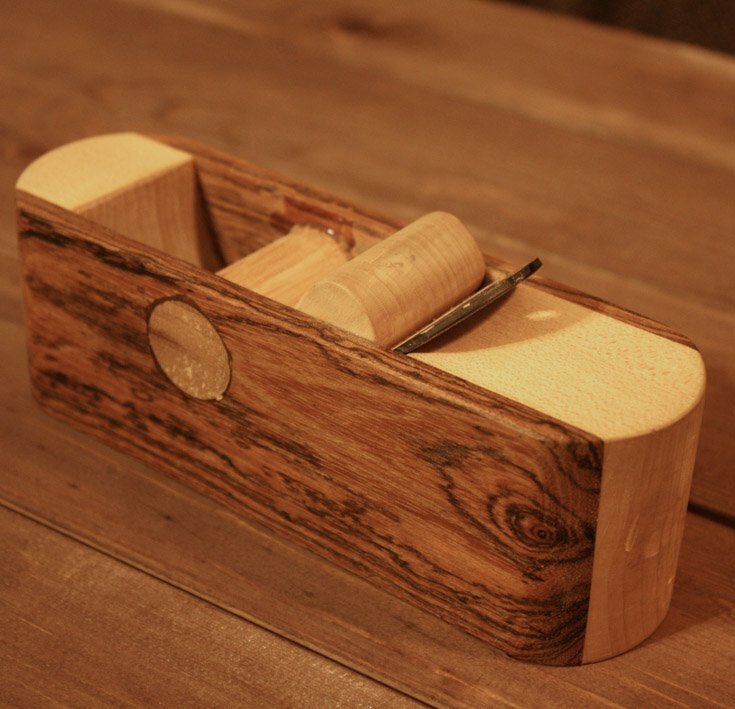 It works very well, and every woodworker should own one. If you have any questions on sharp tools, please leave a comment and I will be glad to answer them. Also, please share my work with your friends on Pinterest! Happy building.